I would like to share with you my first January 2011 teaching trip. 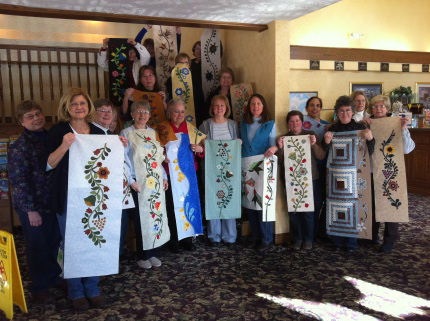 I start the year teaching at The Annual January Icehouse Quilt Retreat in Grayling, Michigan. It is the quilt shop I taught some of my first machine quilting classes many years ago. The retreat started over 10 years ago and many of the same students have attended every year! It is always the first weekend after the new year and everyone is ready to get away and start a new project! We begin the retreat with a reveiw of my past teaching year and then show & tell from the students. A few students brought their projects from previous years. Every year I give students a unique nametag.. This year I think they were really cute. They go on the sewing machine for everyone to see. This is a nice way for old and new students get know each other quickly! Our workshop this year was Folk Garden Borders. 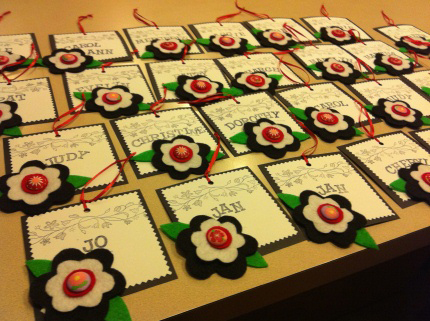 Students learned how to design a unique folk art style border. They also learned or reveiwed the Stitched Raw Edge Machine Applique technique I have been teaching for many years. Here is the group photo- although a few were missing! 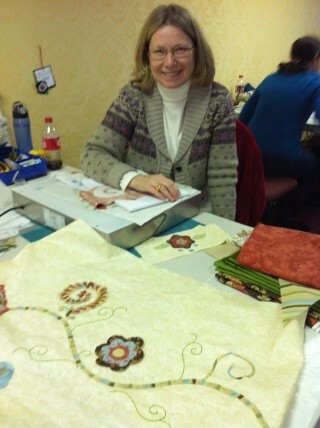 Here is Judy hard at work on her original border design! A good time was had by all! We enjoy having one dinner at Spikes (a typical up north bar!) for the best burger of the year! 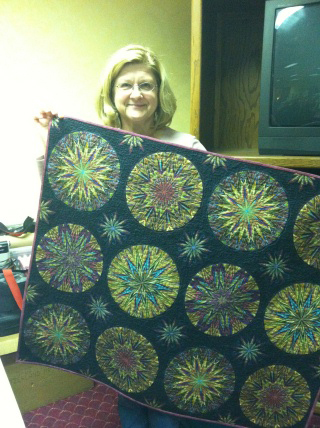 We alternate each year between machine quilting and machine applique. Next year will be “Machine Quilting- Whole Cloth Feathers”…. 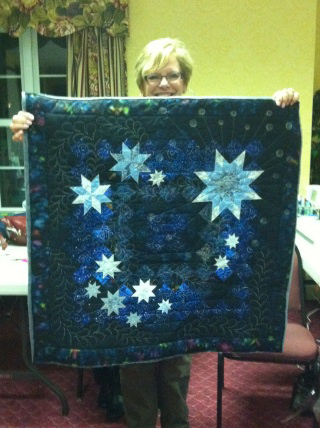 The dates are January 5-8, 2012 (contact Ali at The Icehouse Quilt Shop in Grayling, Michigan for more information). Next post I will continue with my January travels- My sister, Pat Holly and I visit the Indianapolis Quilt Guild… and I thought you might enjoy a photo of me! 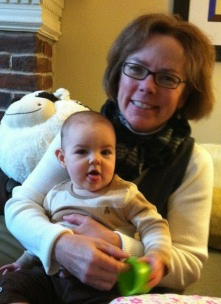 of course with granddaughter Stella! This entry was posted on Saturday, February 5th, 2011 at 5:39 pm	and is filed under Uncategorized. You can follow any responses to this entry through the RSS 2.0 feed. You can leave a response, or trackback from your own site. Entries (RSS) and Comments (RSS). All text and images © copyright Sue Nickels.